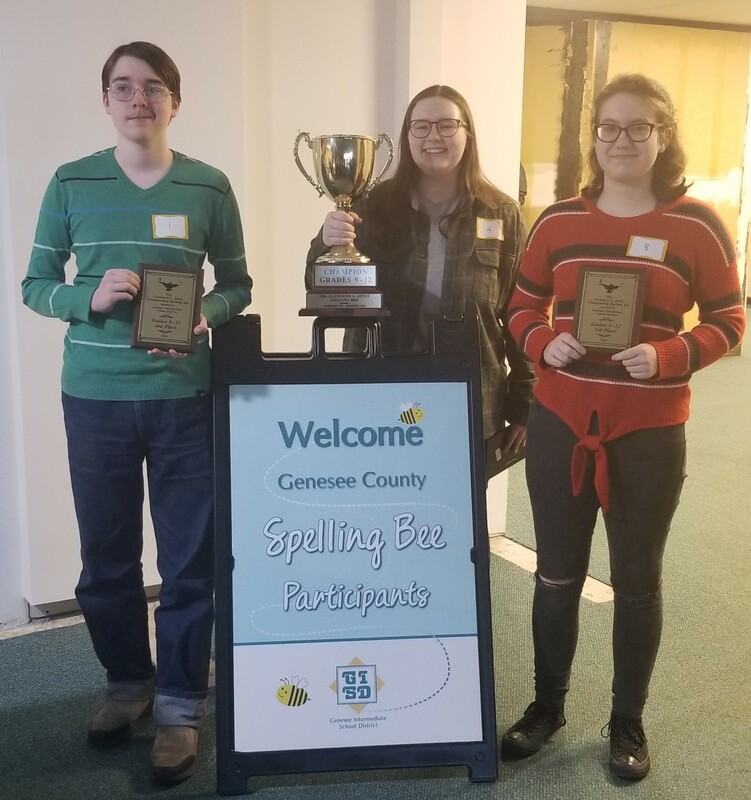 Even the best spellers among us might feel a bit inadequate around Genesee County’s 2019 Countywide Spelling Bee contestants, who withstood intense pressure as they spelled increasingly difficult words in a timed challenge that held audience members spellbound — literally. 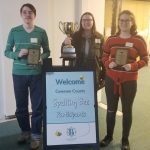 The field of contestants, which started with 226 eager students, gradually whittled down to first, second and third place winners who competed in ‘lightening rounds’ of the grade level competitions at the event held in March. The annual event is a favorite among many area families, who enjoy a certain camaraderie associated with the battle of words. Fourth Grade: 1st – Rachel Moore – St. John Vianney, 2nd – Hady Alouh – Genesee Academy, 3rd – Rosemary Stacey – Holy Rosary. Fifth Grade: 1st – Kamaria Carter-Ryan – Woodland Park Academy, 2nd – Dylan Arntzen – Flushing Elementary, 3rd – Cheyanne Creel – Rankin Elementary. 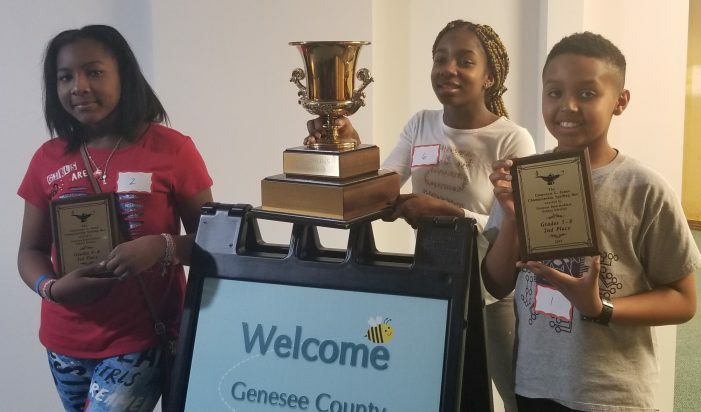 Sixth Grade:1st – Aurora Akinpeloye – Grand Blanc East Middle School, 2nd – Joshua Tewolde – Grand Blanc West Middle School, 3rd – Carter Reynolds – Woodland Park Academy. Seventh Grade:1st – Brendan Lavery – Grand Blanc West Middle School, 2nd – Aloni Baker – Carman Ainsworth Middle School, 3rd – Jack Weichel – St. Paul Lutheran. Eighth Grade:1st – Edward Huang – Grand Blanc West Middle School, 2nd – Grace Polcik – Carter Middle School Clio, 3rd – Eli Richey – Flushing Middle School. Ninth Grade:1st – Alayna Alvarado – Lake Fenton High School, 2nd – Danielle Valliere – Bentley High School, 3rd – Lukas Glomson – Flushing High School. Tenth Grade:1st – Connor Davenport – Flushing High School, 2nd – Tamiah Redwine – Mt. Morris’ E. A. Johnson High School, 3rd – Isaac Tift -Flushing High School. Eleventh Grade:1st – Lily Zuber and 2nd – Madison Griffin – both Flushing High School, 3rd – Gabriella Smith – Lake Fenton High School. Twelfth Grade:1st – Jacob Castles – Flushing High School, 2nd – Dominic Shiel and 3rd – Jessenia Cranfill – both Mt. Morris’ E. A. Johnson High School.